This is an interesting article. Another strategy to determine company culture is to research former employees of the company on LinkedIn (specifically former employees in the department you are interviewing) and view their tenure. If tenures are less than a year, it should give you pause or be a warning sign. 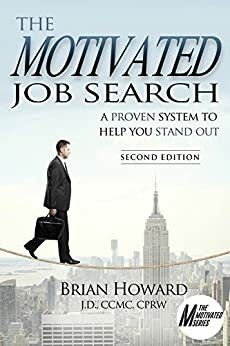 The Motivated Job Search – An Amazon 5 Star Book! The Motivated Job Search was released into the market just 6 months ago (April, 2016). During this brief time, the awareness of the book, mostly by word-of-mouth and referral has been remarkable! The Motivated Job Search has been warmly received by job seekers from all over the country! Amazon recommendations have all been glowing with all reviewers giving the book the highest ranking of 5 Stars! “I have already been receiving emails and LinkedIn messages from readers here in the United States and Canada that are finding the book useful in their job search and recommending it to others.” states Brian Howard, author. If you have not yet requested your booklet containing selected sections from The Motivated Job Search, hit this link and it will be sent to you (in pdf). To read all Amazon reviews follow this link. About the Author: Brian Howard, J.D. is a Certified Career Management Coach (CCMC), a Certified Job Search Strategist (CJSS), a Certified Professional Resume Writer (CPRW), and an actively practicing executive recruiter. He has helped thousands of job seekers over his 24 year recruiting career. It is from this experience and knowledge that he wrote The Motivated Job Search. © 2016 Brian E. Howard, All Rights Reserved. Brian Howard was recently interviewed for a podcast on CareerMetis.com. Click this link to listen to the interview. The interview covers interesting topics about job search mindset and motivation, differentiation, LinkedIn, and the 5 most important questions hiring executives need answered before they can extend an offer. CareerMetis.com is an award-winning Career Blog where individuals are able to obtain ideas and strategies to land their dream job or career. In addition to job search advice, the Blog also provides information for professionals on improving their communication and leadership skills to take their careers to stratospheric levels.